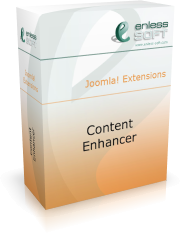 Here you can take a look at the Content Enhancer user interface. This is the form used to create or edit a content variable. Shows an overview of all defined content variables. This is the form used to create or edit an automatic content replacement. Shows an overview of all defined automatic content replacements. This is the form used to create or edit a group for automatic replacements. Shows an overview of all defined groups for automatic replacements. This is the form used to create or edit a group for content variables. Shows an overview of all defined groups for content variables. An example definition of a content variable using the PHP value type. An example definition of a content variable using the SQL constant value type. An example definition of a content variable using the Text value type. An example definition of a content variable using the list random value type. An example definition of a content variable using the SQL random value type.